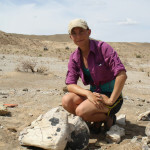 If you remember our post last month about [Mary Anning], today’s post describes the discovery by a woman who lived at the same time and in the same country – Mary Ann Woodhouse. A portrait of Mary Ann Mantell. From Wikipedia. 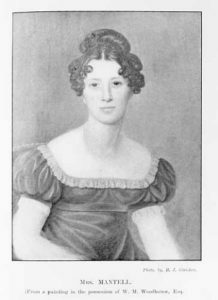 Mary Ann was born in 1799 in England. She married a doctor (Gideon Mantell) in her early 20s and took his last name, becoming Mary Ann Mantell. She would accompany him to visit patients. On one of these occasions, she was waiting outside and went to examine the gravel on a recently paved road. Among the gravel she found large teeth (but see note below)! 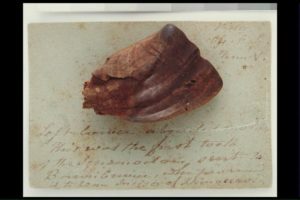 One of the teeth that Mary Ann found. Photo from the Te Papa Tongarewa Museum of New Zealand. She showed them to Gideon, who was also an amateur paleontologist. Realizing that the teeth belonged to something new, he consulted well known paleontologists at the time to discover that these teeth belonged to a large, ancient herbivore. He named the dinosaur Iguanodon (for “Iguana tooth”) and went on to publish a book about this and other fossils of the area with the help of Mary Ann who illustrated all of the fossils. 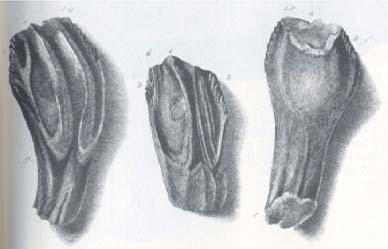 Mary Ann’s illustration of the teeth. From Wikipedia. Note: Even though Mary Ann did make the illustrations for the book, her discovery of the teeth is debated. Once I do more research, I’ll edit this post accordingly. This entry was posted in English and tagged Chicks that Dig, Iguanodon, Ladies of Science, Mary Ann Mantell, Women in Paleontology. Bookmark the permalink. 3 Responses to Who Discovered the Iguanodon? This is a fairy tale that is not supported by actual documentation. Mantell himself makes it clear that he obtained the teeth in question from quarrymen. Dennis Dean has nicely documented all of this in his excellent biography of Gideon Mantell. I am a bit surprised that Dr. Neurosaurus adopted this long-discredited story. There’s very little information about this publicly available online. As I’m out of range of a scientific library, my sources are limited. I’ll add that book to my list of reading. Thank you for pointing it out.